Probainognathus is an extinct relative of mammals that has played a prominent role in research by paleontologists who study the evolutionary events leading up to the origin of that group. Probainognathus is known from late Triassic (~230 million years old) sediments of Argentina. Even though it predates the origin of mammals by nearly 100 million years, Probainognathus exhibits numerous unique features that indicate its transitional nature between still older fossils and the earliest mammals. From studying Probainognathus and its relatives, paleontologists have discovered many remarkable details about how the unique structures of the jaw, teeth, middle ear, and brain evolved in early mammals. Probainognathus is a member of Eucynodontia, a lineage that includes mammals and their closest extinct relatives. Other eucynodonts featured on this site, also from the Triassic of Argentina, are Ecteninion, Exaeretodon, and Probelesodon. Probainognathus is represented by only about three dozen specimens, and this specimen is the only known skull of a very young juvenile. The relatively large size of the orbit, which held the eyeball, is one of many indications of its immaturity. In this specimen, the internal structure of the braincase, inner ear, and snout were of interest to paleontologists, but these regions were inaccessible prior to CT scanning. This specimen was collected from the early Upper Triassic Ischigualasto Formation of northwestern Argentina by paleontologists at the Universidad Nacional de San Juan. The specimen was made available to the University of Texas High-Resolution X-ray CT Facility for scanning by Dr. Oscar Alcober of the Museo de Ciencias Naturales, San Juan, Argentina, and Dr. William Sill of the Universidad Nacional de San Juan, Argentina. Funding for scanning was provided by a National Science Foundation Digital Libraries Initiative grant to Dr. Timothy Rowe of The University of Texas at Austin. The specimen was scanned by Richard Ketcham and Matthew Colbert on 14 January 2000 along the coronal axis for a total of 496 slices, each slice 0.085 mm thick, with an interslice spacing of 0.0641 mm (for a slice overlap of 0.0209 mm). Bonaparte, J. F., and A. W. Crompton. 1994. 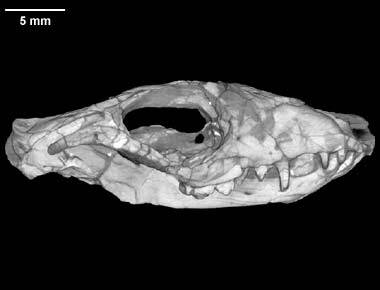 A juvenile probainognathid cynodont skull from the Ischigualasto Formation and the origin of mammals. Revista del Museo Argentino de Ciencias Naturales Bernardino Rivadavia 5:1-12. Quiroga, J C. 1980. Endocranial cast of the cynodont, Progainognathus jenseni (Reptilia, Therapsida), from the Ischichuca Formation (Middle Triassic), La Rioja, Argentina. Ameghiniana 17:181-190. Romer, A. S. 1970. The Chañares (Argentina) Triassic Reptile Fauna IV. A chiniquodontid cynodont with an incipient squamosal-dentary ancestry. Breviora 344:1-18. To cite this page: Dr. Timothy Rowe, Dr. William Sill, Universidad Nacional de San Juan, 2001, "Probainognathus sp." (On-line), Digital Morphology. Accessed April 19, 2019 at http://digimorph.org/specimens/Probainognathus_sp/.